Season 24 of the ABC hit reality competition asked contestants to recall their “most memorable year” on Monday, which has become a “heart-touching” tradition for the show. … “A-Team” Mr. T, despite a dance that was his best so far. Earlier, Normani Kordei recalled when she got a big break in the music business, and got a backup from her Fifth Harmony bandmates for her Rumba. But while Len Goodman thought he “needed more,” the rest of the judges liked her touching performance. “This was your best dance, calm down and keep up the good work,” Julianne Hough told him. “Now I have seen you with your shirt off, we’ve so much in common,” Goodman quipped. Nancy Kerrigan had a very public “bad year” when she was clubbed in the knee in 1994, but she chose a different series of incidents to focus on — suffering six miscarriages. “I almost felt shameful,” she said, breaking down in tears. The water works were pouring, as Inaba told him that he was winning their hearts. “Your faith radiated out of you during that dance,” she said. Former “Glee” actress Heather Morris chose 2015 as the year she got married to her former high school classmate, Taylor, opting to perform to her wedding song “Shut Up and Dance” by Walk the Moon. 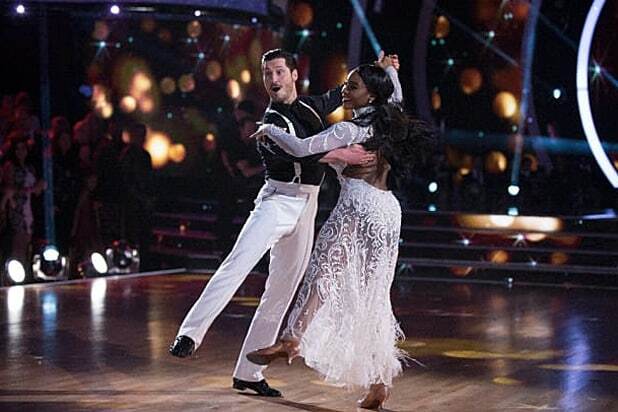 “Sharp, crisp, great hip action … I thought it was lovely,” Goodman said of the fun routine. “You still have the vitality of a spring chicken and the impetus of a teenager on a first day,” Bruno Tonioli told the baseball champ, despite a bit of hopping and skipping. NFL player Rashad Jennings shared his tumultuous relationship with his estranged father, up until the year when his dad suffered a stroke and had his leg amputated in 2006. “It was bigger than football … my dad got lost at one point, but I was happy to be there for him,” Jennings said. “You show up as you … you are bold and you are fearless,” Inaba said after the raunchy routine. Olympic gymnast Simone Biles, 20, doesn’t have as many years as the other contestants to pick from, so she went for the year 2000 when she was adopted by her grandparents. Yep, that is a pretty momentous life moment. “Sometimes being perfect is not the story we need to tell,” Hough said of Bile’s tearful performance. Needless to say, professional bull rider Bonner Bolton said his most memorable year was 2016 — when he nearly died in a devastating accident that snapped his neck. “Welcome to the competition,” Goodman added.